A Bristol company has expanded into North Somerset by investing £250,000 in a village pub and pledging to axe the old strict car parking rules, which had angered the community. Mezze Restaurants has taken over the Ship & Castle in Congresbury with the aim of returning the pub to its rightful position as the hub of the community, as well as adding a new mezze and a la carte restaurant. The previous landlady had installed signs warning drivers they would be fined if they used her car park for all-day parking without permission, which turned a lot of prospective customers away. Parish council chairman Peter Sewell said at the time the signs had caused “raised eyebrows among the community” as there was a general feeling that it could be used as a general car park during the day. Mezze Restaurants says it does not agree with such strict enforcement of the rules and will not be issuing parking tickets or fines. Instead they hope that with goodwill on both sides, the car park can be used by anyone during the day and just ask that everyone supports their new venture by popping in. They believe that being on good terms and cooperating with their neighbours is the best way to create good working relationships and earn their place in the local community. Alex Tryfonos, Mezze owner, said: “We already run two successful Mezze pubs in Downend and Thornbury and are thrilled to be expanding into North Somerset. “We already provide more than 70 jobs in our other restaurants and there will be an extra 30 new full and part-time jobs for Congresbury and the surrounding area. The garden has seen a £75,000 makeover with new raised decking, herb garden, kids’ play castle, water features, an outside TV for the Olympics and a new ice cream parlour. 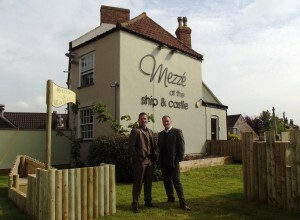 Mezze At Ship & Castle opens to the public on May 28th, following a series of pre-launch evenings for local people to see how the place has changed. The official launch evening takes place on Friday May 25th, conducted by former Bristol FC player Scott Murray, at 7pm. Alex added: “We are delighted to welcome Scott to officially launch our new venture and we hope everyone will come and see what we have done to the old place. “As well as striving to support the local community, we will also be looking to local suppliers to provide many of the ingredients for their mezze. “We have a team of executive and head chefs at Mezze who have gained very broad experience at Browns, Severn Shed, Aqua, Melbournes and Redcliffs to name but a few. Tried the Thornbury Mezze recently and thoroughly enjoyed it. I've written a review on Food with Drink. I have also heard a good report on the Ship & Castle too.